Welcome! to the Power of Proof newsletter from Surety! Here you will read about latest news in scientific intellectual property protection, along with specific Surety initiatives addressing current IP protection trends, concerns and technology advances to better protect and legally defend your organization’s most critical electronic research and lab data. We welcome feedback about the content provided at info@surety.com. How Legally Defensible is Your Ownership of Your Scientific IP? Agilent Technologies Integrates Surety’s AbsoluteProof Service into OpenLAB Electronic Lab Notebook, Enhances Data Integrity, Protection. Bolsters Intellectual Property Protection, Streamlines “Sign and Witness” Process. Biotech Company Ansaris Selects Surety for Integrity and Authenticity Protection of Its Lab Informatics Data. AbsoluteProof Eases Process Scientists Follow to "Sign" and "Witness" Volumes of Research Records. 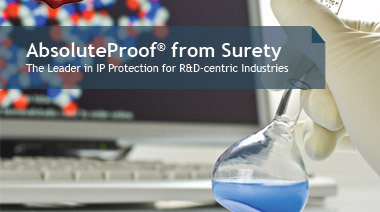 Joint BioEnergy Institute Selects Surety’s AbsoluteProof to Protect the Integrity and Legally Defend the Authenticity of its Scientific Intellectual Property. Surety partnered with Michael Elliot of Atrium Research & Consulting and Timothy Carroll, Partner at Loeb & Loeb, LLP to host a webinar series about ERM, the concerns about “digitizing” records and best practices for improving an organization’s data security and integrity. The first podcast series will address the following subtopics: The Benefits of an Electronic Lab Environment; Data Level Security and Authenticity Controls a Trusted Witness in Electronic R&D Environments; and Protecting the Lifeblood of an Organization Through Across the Board Data-level Security Controls. Protect IP Ownership and Streamline your “Sign and Witness” Processes for Improved Lab Operations. Summary: Much of a prominent South Korean stem cell scientist’s research was discredited based on findings that his research was faked. The allegations of inauthentic research led to a prosecutorial investigation, public backlash and unspecified disciplinary action for the research scientist. This research scientist’s livelihood hinged on his reputation within the scientific and academic communities. Without proper safeguards in place to securely maintain data and guard against content alteration, this researcher and the university who employed him was placing his intellectual property and reputation at great risk.